Saturday marks the 70th anniversary of the astronomical observatory of Pittsburgh's original Buhl Planetarium and Institute of Popular Science, which was located in the Allegheny Center section of the city's North Side. Originally known as "The People's Observatory" and located on the building's third floor, the primary instrument was a rather unique 10-inch Siderostat-type Refractor Telescope, manufactured by Chicago's Gaertner Scientific Company. Dedicated on the evening of Wednesday, November 19, 1941, first light was an excellent view of the planet Saturn. The keynote address was given by noted twentieth century astronomer Harlow Shapley, at that time Director of the Harvard College Observatory. The Buhl Planetarium Observatory, although dedicated to public use, was constructed to research observatory specifications at a cost of $ 30,000 (1941 dollars). The Buhl Planetarium and Institute of Popular Science had actually been dedicated and conveyed to the City of Pittsburgh, by the Buhl Foundation (at that time, the thirteenth largest foundation in the country! ), on Tuesday Evening, October 24, 1939. Prior to the Observatory dedication ceremony, Buhl's third floor observatory had been used by the Amateur Astronomers' Association of Pittsburgh (AAAP) for public observing with portable telescopes. The Buhl Planetarium Observatory's first telescope was a portable telescope, the 4-inch Zeiss Terrestrial Refractor Telescope. Once the Siderostat Telescope was in use, AAAP members supervised public observing sessions on clear evenings--at that time, Buhl was open to the public every evening (except New Year's Day) until 10:30 p.m.! Along with the acquisition of Buhl's Zeiss II Planetarium Projector (prior to the 2002 dismantling, the oldest operable, major planetarium projector in the world! ), the Buhl Planetarium also ordered a portable telescope from the Carl Zeiss Optical Works in Jena, Germany in 1939, for use in the Observatory. To the dismay of Buhl officials when opening the package from Germany, they received a 4-inch terrestrial refracting telescope (which uses additional optics to show a right-side-up image); they had ordered an astronomical refractor telescope (which has fewer lenses to degrade the image and shows an upside-down image). However, with the commencement of World War II on Friday, September 1, 1939, they could not return the telescope to Germany and have an astronomical refractor sent in its place. Hence, they had to make-do with a terrestrial refractor. So, today the City of Pittsburgh owns a good Zeiss telescope (now used at the Henry Buhl, Jr. Planetarium and Observatory of The Carnegie Science Center) with a very interesting history! In addition to evening use, the Siderostat Telescope projects a superb display of the Sun onto a large projection screen, showing both sunspots and granulation on the solar surface. Two diagrams of the planet Earth, drawn on the projection screen, help the public compare the size of sunspots to our planet. Observatory operators use a piece of wood, placed at the telescope's focal point (the piece of wood immediately catches fire), to demonstrate to the public the dangers of viewing the Sun with optical devices. By temporarily deactivating the clock-drive device of the telescope, observatory operators also clearly demonstrate to the public how fast the Earth rotates, as they watch the Sun quickly move off of the screen. During daytime hours, the public has also been able to view the planets Mercury, Venus (showing phase), Mars, and Jupiter (including cloud belts), as well as the Moon and stars down to third magnitude, with the Siderostat Telescope. Although primarily used for public observing, the Siderostat Telescope has been used for some research, from time-to-time. During the 1980s, Buhl Planetarium Lecturer Francis G. Graham (Founder of the American Lunar Society) took photographs of the South Pole area of the Moon, as part of a cooperative research project with other American astronomers. These photographs aided the production of a better map of the South Pole area of the Moon, than existed at that time. Dedicated as "The People's Observatory" in 1941, this name fell out of use after World War II. During the Cold War, the proliferation of Communist states known as "People's Republics" tarnished the meaning of the word "People's." Hence, "The People's Observatory" name was no longer used--which is a shame considering that Buhl Planetarium used the word "People's" first! Another interesting historic anecdote: On the same evening of the Observatory dedication, Buhl started a new Planetarium Sky Show and opened a new gallery exhibit. The Sky Show, regarding Celestial Navigation, was titled "Bombers by Starlight" (Buhl provided Celestial Navigation classes to many military servicemen, during World War II). The new exhibit, in Buhl's lower-level Octagon Gallery (which encircles the planetarium projector pit, below the planetarium's "Theater of the Stars") was titled "Can America Be Bombed?" This exhibit opened two and one-half weeks before the Japanese bombed Pearl Harbor, Hawaii! During the 1980s and early 1990s, Buhl's Siderostat Telescope was the second largest Siderostat-type telescope in use in the world. This type of telescope is mounted permanently on concrete piers and does not move, save the movements of the planet. A flat, first-surface mirror moves with the sky and reflects objects into the 10-inch objective lens. The telescope eyepiece is mounted on the other side of a wall, allowing the public to view objects in a heated Observing Room, while the telescope and mirror remain in the outdoor, air-temperature Telescope Room, with a hand-operated, roll-away roof. The largest siderostat-type telescope, at that time, was a 15-inch Brashear-Fecker Siderostat-type Refractor Telescope at the Flower and Cook Observatory of the University of Pennsylvania, located in suburban Philadelphia. In August of 2007, this telescope, produced by Pittsburgh's Brashear-Fecker Company, was dismantled. Along with other telescopes, the University of Pennsylvania donated this telescope to the Northeast Florida Astronomical Society which is seeking to build a new observatory and science center in the Greater Jacksonville region. There has been no news regarding the progress on the NEFAS Philadelphia Project. Jean Leon Foucault, who developed the first Foucault Pendulum (which demonstrates that the Earth rotates on its axis), also designed the Siderostat (Sidereal Coelostat) type Telescope in the nineteenth century. Altlhough he was not able to actually build a Siderostat Telescope before his death, the largest such telescope was constructed for the Paris Universal Exhibition of 1900. The telescope used for this installation was the largest refractor telescope ever constructed, with an objective lens having a diameter of 49.2 inches! After the year-long exhibition, the builders could not find some one to buy the telescope. Hence, the telescope was scrapped, but the original lenses are still kept at the Paris Observatory. Pittsburgh's original Buhl Planetarium and Institute of Popular Science (a.k.a. Buhl Science Center) closed as a public museum on Saturday, August 31, 1991. A new and much larger Carnegie Science Center opened a mile away, on the north shore of the Ohio River, on Saturday, October 5, 1991, which included a new Henry Buhl, Jr. Planetarium and Observatory. The original Buhl Planetarium Observatory, along with Buhl Planetarium's original Theater of the Stars, was used for Carnegie Science Center science classes (as no classroom space was originally built in The Carnegie Science Center), until the original Buhl Planetarium building was completely closed in February of 1994. Buhl Planetarium's Siderostat Telescope was also dismantled in October of 2002, during rehabilitation for expansion of the Children's Museum of Pittsbugh into the Buhl Planetarium building. The telescope is currently in storage. Pittsburgh's Carnegie Science Center has stated an interest in reassembling the Siderostat Telescope in a new roof-top observatory, which would be constructed as part of a proposed expansion of the Science Center building. However, at this time, there is no funding or timetable for construction of the proposed building expansion. The original Observatory chamber is currently being used as a board room for the Children's Museum of Pittsburgh, which is now using the original Buhl Planetarium building as part of their museum. 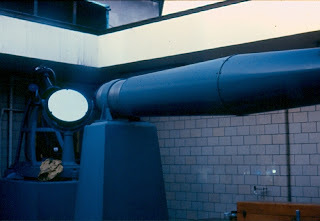 Friends of the Zeiss has always considered the original Observatory chamber, which already exists (and, which was specifically designed for the Siderostat Telescope), as the best place to use the 10-inch Siderostat-type Refractor Telescope. The re-installation of the Siderostat Telescope in this original chamber would provide new educational opportunities for children visiting the Children's Museum of Pittsburgh.